Our recent trip to Camotes Islands was the first time I set foot in Cebu. 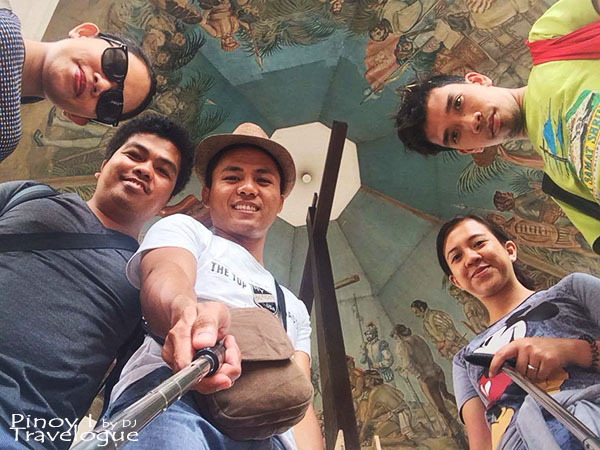 My buddies, being jaded with the bustling life in Metro Manila, were firm in skipping a tour around the prime capitol of Cebu as it was just reminiscent to the busy districts of Manila according to them. I have to agree though after experiencing the nose to tail traffic first-hand. It's a bit frustrating for me but I had to follow the majority, we're in a democratic country after all. 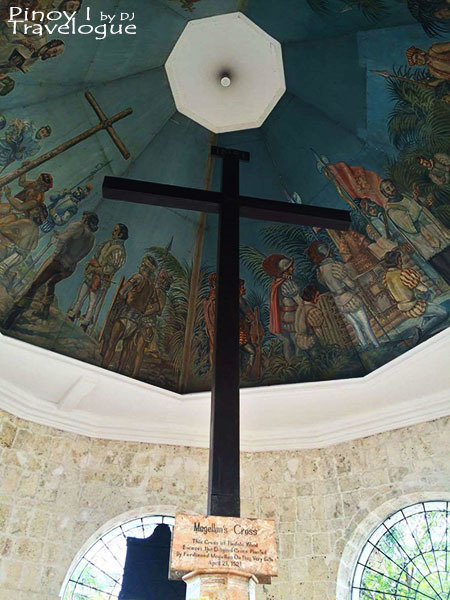 But as fate would have it, someone insisted to hop on a jeep going downtown before heading back to Manila and pay a visit to a prominent landmark which he playfully referred to as every traveler's "evidence" of having been to Cebu; the Cross of Magellan. 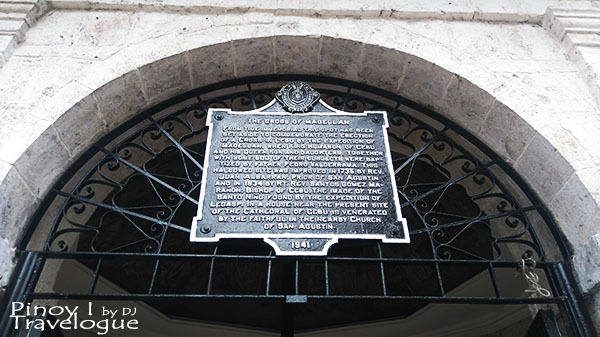 History recounts that when Ferdinand Magellan arrived in Cebu in 1521, he was able to befriend some local chieftains and converted them and hundreds of their constituents into Roman Catholicism. European explorers, under Magellan's order, planted this historic piece of wood on the same ground where the popular landmark stands to signify the natives' acceptance of Christian faith. 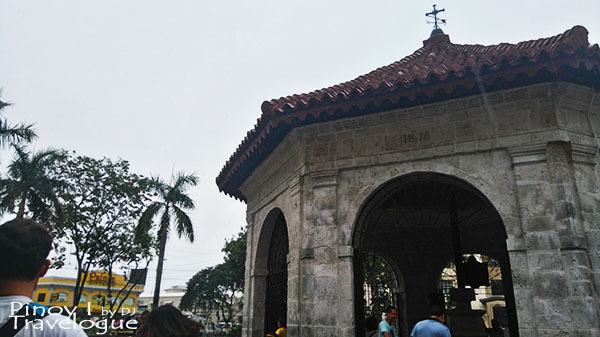 Magellan's Cross is housed in a modest octagonal kiosk, which is actually a chapel, located along the street named after the famous Portuguese explorer. This hallowed site was made of stone walls resembling that of the nearby Sto. Nino Basilica with its eight faces perforated by large grilled arched openings and it's roof was made of red interlocking tegula tiles. While the black historical marker mounted at the grille of the structure narrates the site's glorious moments through inscription, the chapel's ceiling provides a depiction of it. 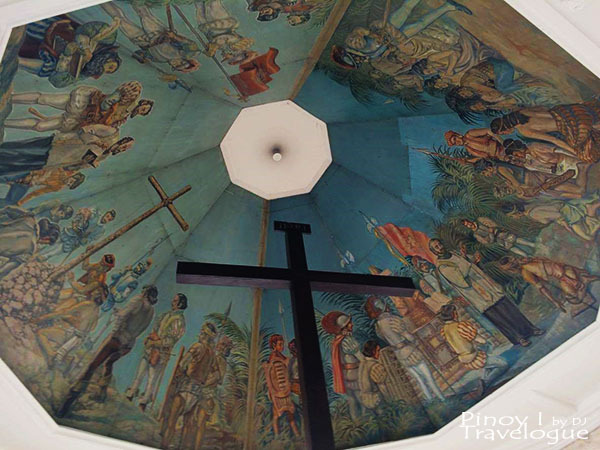 A circular mural above the cross immortalizes the momentous events that laid the foundation of Christianity in the country; the landing of Magellan in the island of Cebu, conversion of Rajah Humabon, his wife Queen Juana and his men, and the planting of the symbolic cross. A bunch of ladies seemingly past middle age dressed in bright yellow top and red skirt sell colored candles at PHP 10 per candlestick. Each color represents an aspect of life; green for success, yellow for health and peace, pink for happiness, blue for the devotion to Mary and red for the devotion to Sto. Niño. Payment comes with a traditional rite performed by the vendor, characterized by forward and backward steps while waving the unlit candle and chanting indistinct prayer in a dialect that sounded foreign to me. Plenty of blogs suggest that they murmur a Sinug prayer and their movements were similar to the steps performed in Sinulog festival. After the ritual, the candles remained unlit to spare the shrine from smoke may be offered at the foot of the cross or may be taken home like I did. An inscription at the base of the cross denotes that the smoothly stained wood standing at the middle of the pavilion is not the actual cross planted by Magellan in April 21, 1521. In the past century, people chipped away pieces of the original cross as a souvenir or in the belief that it possessed miraculous powers. To preserve the remains of the relic, splinters were encased in a cross-shaped tindalo wood that tourists see today. The authenticity of Magellan's Cross, however, has long been in question. Rumor has it that the outer casing confines only a replica, not the original cross. Accounts of Antonio Pigafetta, Magellan's assistant who kept accurate journal of their expedition, mentioned that the cross was torn down by our pagan ancestors after the battle that lead to the killing of Ferdinand Magellan. But whether this side of the story is true or not, what matters is that the identity which Magellan and his men unknowingly rooted hand in hand with the iconic cross had flourished and presently defines the deeply rooted faith and rich culture of the Filipino people. 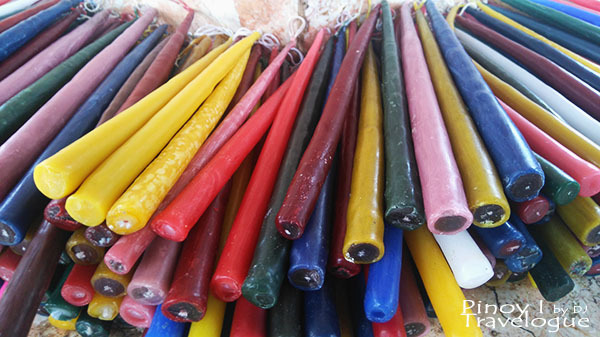 Immerse in Filipino's rich culture by buying those colorful candles and witnessing the traditional Sinug ritual. You might not be a Catholic believer or some sort, but a crumb from your travel budget is of great help to the candle sellers whose income depend on the number of candlesticks sold for the day. 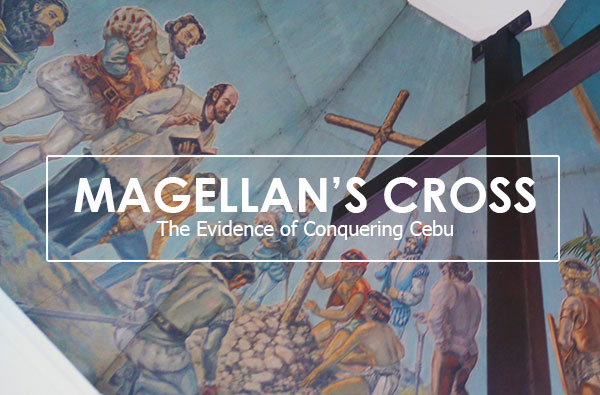 Mention Cebu to someone and probably, Magellan's Cross would come on top of his mind. So a photo of you with this prominent landmark might prove that you have conquered the Queen City of the South. Wow! Great blog. This is great, indeed a great thing. Thanks for this one.